Few anime can rival Fullmetal Alchemist’s success, a franchise so popular it spawned not one, but two anime adaptations. And that’s not even counting the various OVAs, video games, and other merchandise that exploded onto the scene during and after each show’s run. Needless to say, everyone wants a piece of Fullmetal Alchemist to take home with them and make a part of their lives. 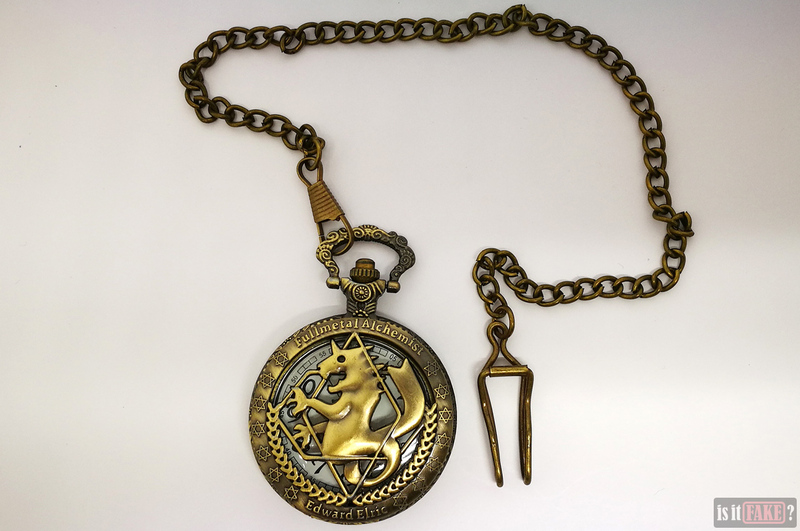 While collecting toys has always been trendy with anime fans, others have taken to purchasing replicas of items featured in their favorite series, such as a specific hero’s sword, a heroine’s costume, or in this case, Edward Elric’s State Alchemist pocket watch. 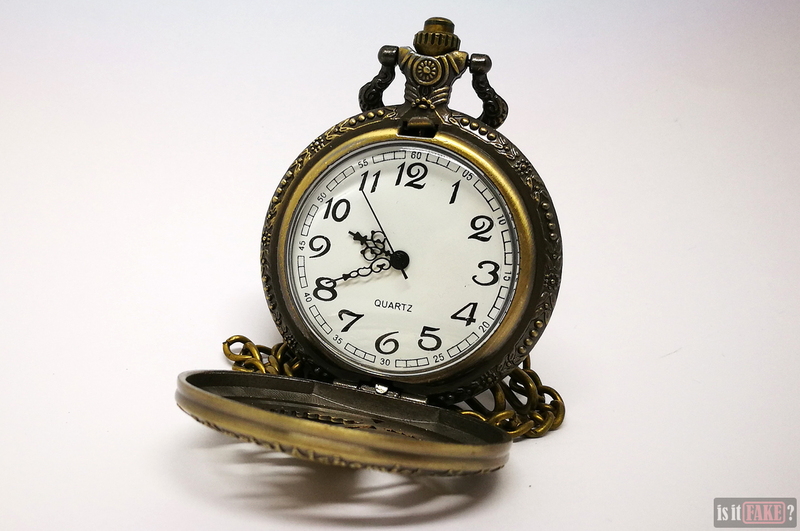 A pocket watch may seem a complicated thing to fake, but it’s been done before, and numerous bootleggers are still doing it today. When that watch is attached to a name as aromatic as Fullmetal Alchemist, pirates know they’ve got a bestseller on their hands. Sadly, when it comes to fakes, you get what you paid for. If you want high-quality original products, it’s best to stay away from eBay. The online marketplace is overrun with bootlegs – many of them from the top producer of counterfeit items in the world, China. 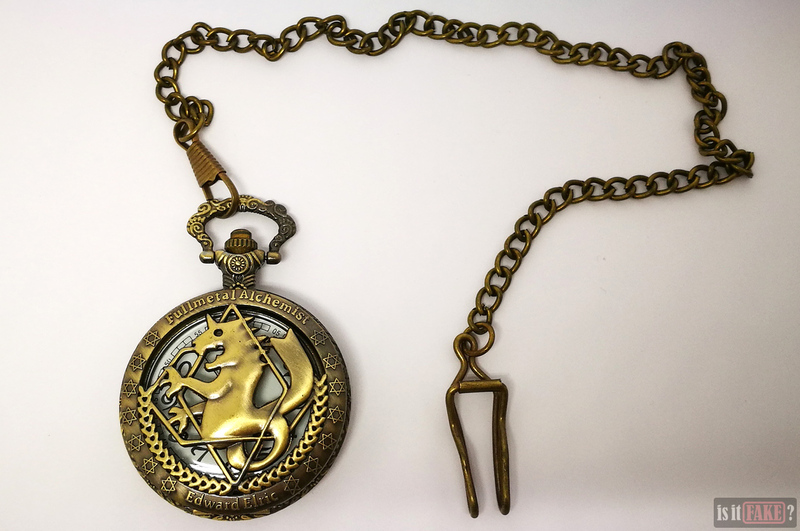 Needless to say, we acquired our fake Fullmetal Alchemist pocket watch from eBay. How do we know it’s a fake, you ask? 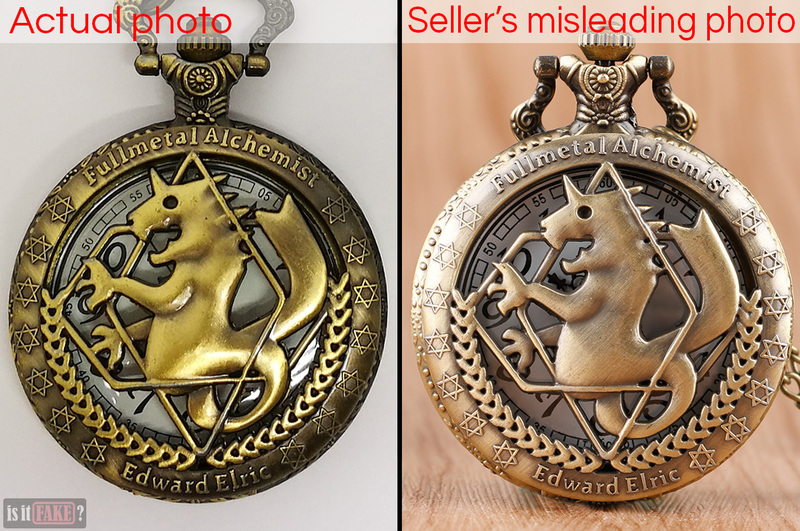 Well, for starters, the seller lists it as “unbranded.” All licensed manufacturers and distributors of Fullmetal Alchemist merchandise are well-known, with Bandai, Cospa, and Viz Media among them. That this watch should come with no brand is extremely peculiar. But that’s not all that’s wrong with this pocket watch. 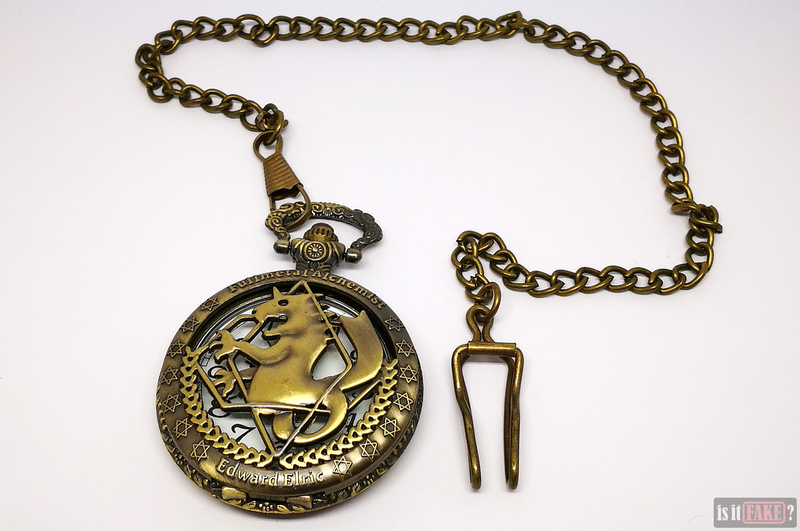 The fake Fullmetal Alchemist pocket watch is an old-fashioned hunter-case timepiece. It appears to be made of bronze. 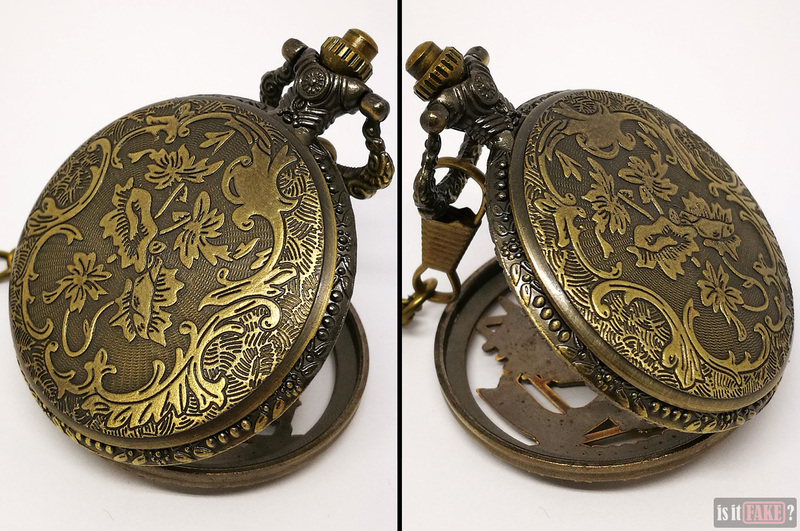 The fake pocket watch is mapped with discoloration. Dark stains creep across its surface, gathering in corners and turning some areas dark enough to obscure sculpted details. The end result is an item that looks like it’s been untended for decades, so much so that it has become coated in grime. Not only does it look dirty because of this, its color has also become grossly uneven. 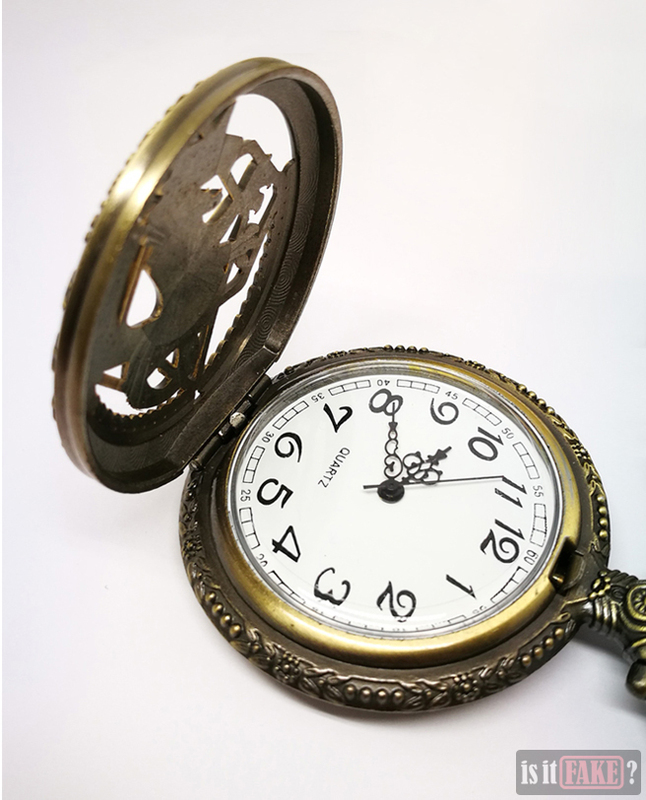 In the seller’s photo, the pocket watch is much cleaner, misleading buyers into thinking what they’ll get is something just as unblemished. They’re not even the same color, with the Amestrian Dragon on the actual product boasting an unsightly urine-yellow tint. 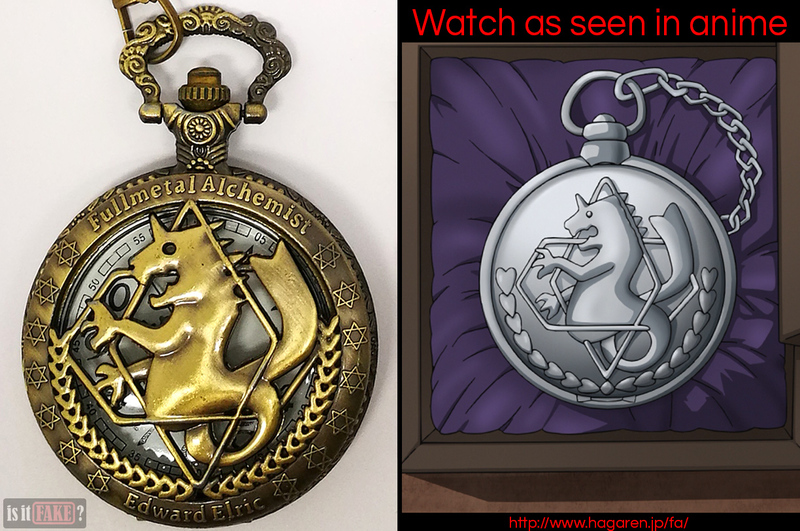 In the anime and manga, the State Alchemist pocket watch is silver. 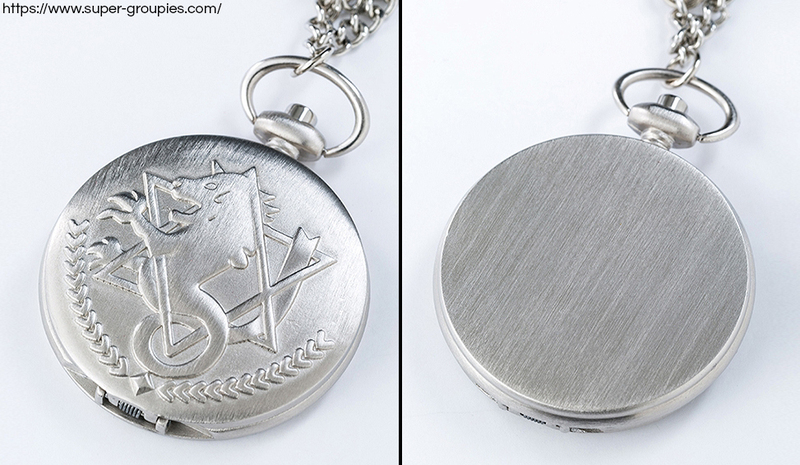 It has no holes, hexagrams, or the words “Fullmetal Alchemist” and “Edward Elric” on its circular lid. There are numerous other inconsistencies, which are all readily observable. 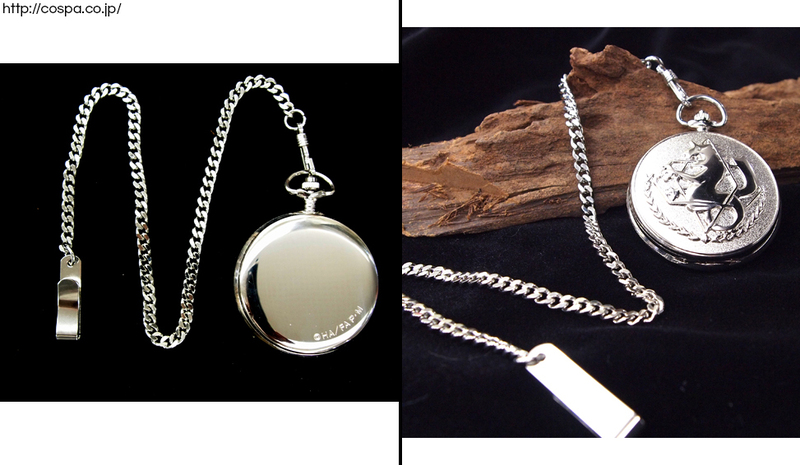 Because it doesn’t properly represent the object it’s based on, this fake pocket watch is useless as a cosplay item. It’s also no good as a replica for the same reasons. Pressing the latch release on the fake watch’s crown springs open the circular lid, revealing the watch face underneath. The fake watch’s inner rim is even darker than the rim of the lid. 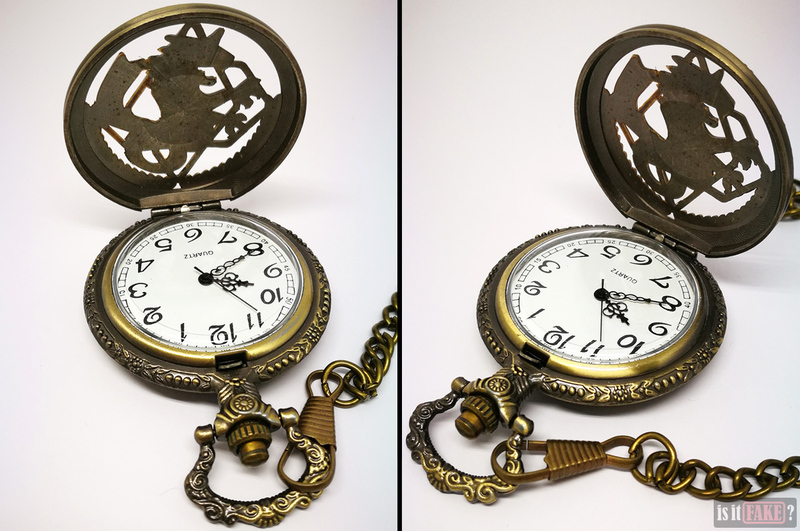 It also seems the fake pocket watch doesn’t come with batteries, as it isn’t working. 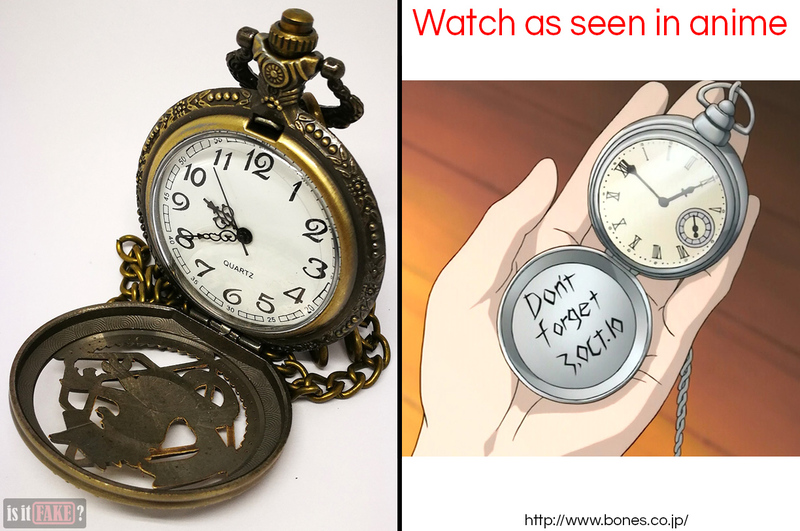 Like the fake watch’s case body and lid, its watch face is not an accurate representation of the watch in the anime and manga. 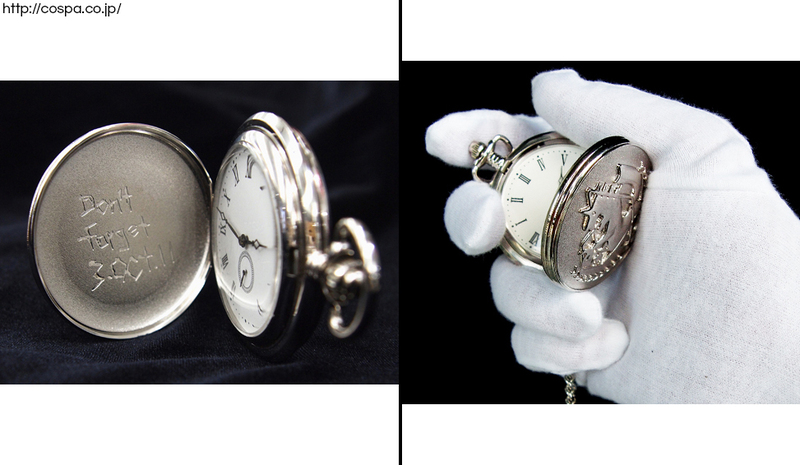 As you can see in the side-by-side comparison above, the anime/manga pocket watch features roman numerals, ordinary-looking hour and minute hands, and a small, watch-like counter. In addition to these differences, the fake watch has ugly rectangles between the minute markers. As for the watch chain, it’s removable. It’s just as dirty as the watch. Lastly, the fake watch and chain give off a strange, musky odor. It’s not exactly overwhelming, but the stench does stick to your fingers after prolonged skin-to-watch contact. 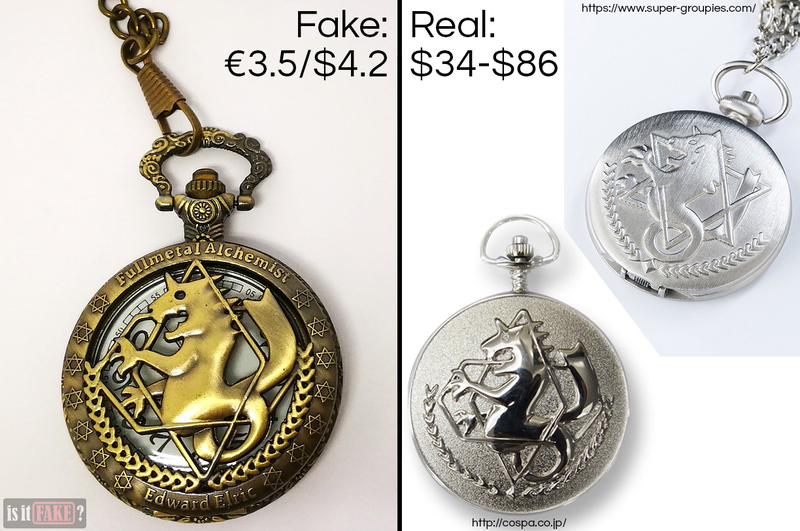 Officially licensed Fullmetal Alchemist pocket watches are more expensive than the fake, true. 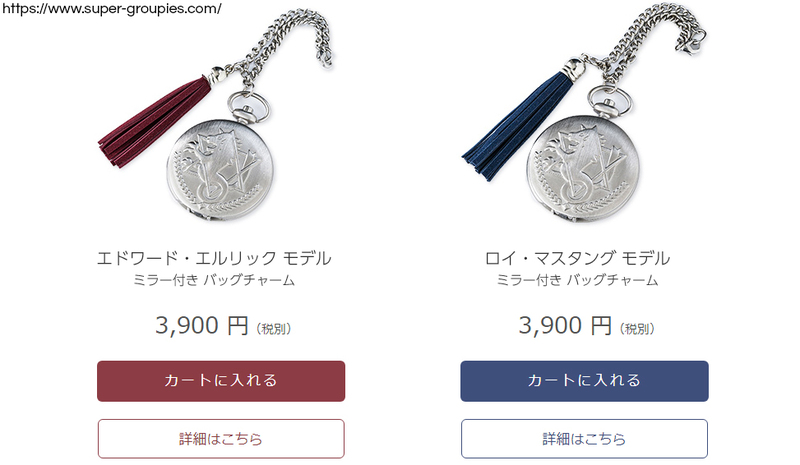 But that’s because they’re accurate replicas of the watch as featured in the anime and manga, and look as luxurious in person as they do in the photographs. 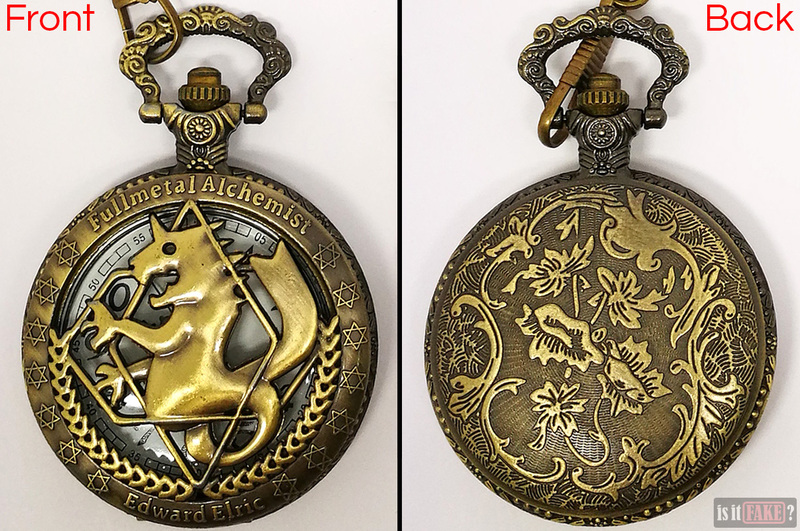 Several legit companies manufactured licensed Fullmetal Alchemist pocket watches during the anime’s heyday. 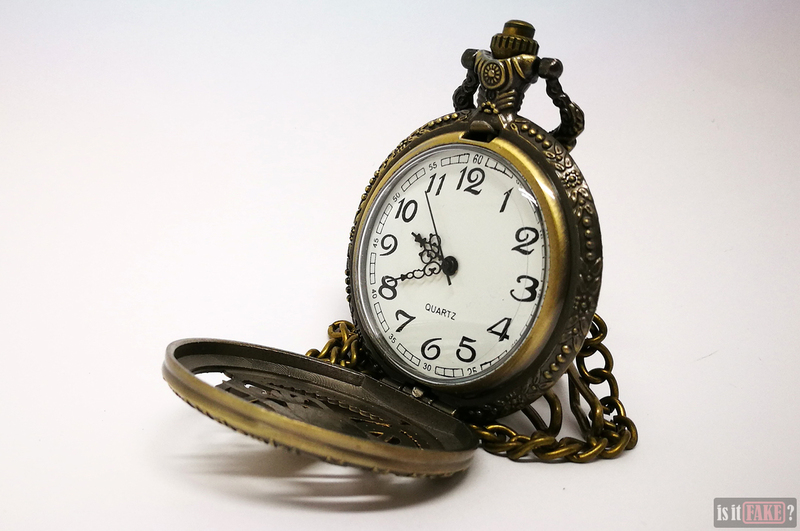 Today, there are markedly fewer of such watches in production. Thankfully, if you know where to look, you can still find one to buy. 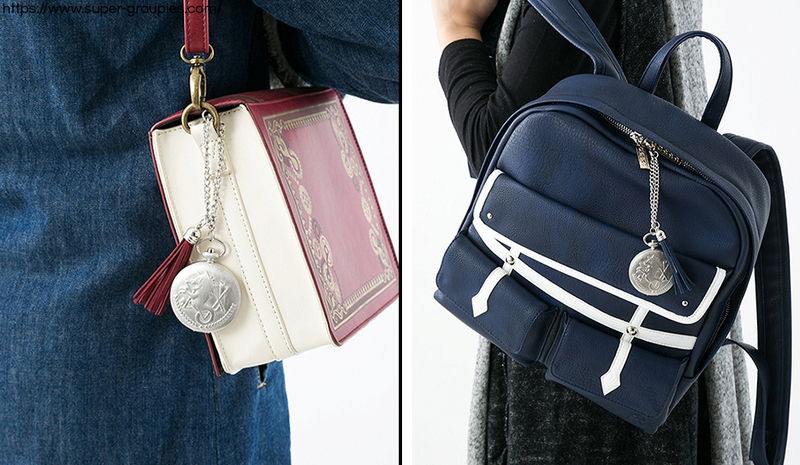 Japanese company SuperGroupies currently has a new line of wonderful Fullmetal Alchemist accessories, including a variety of bags, wallets, and yes, pocket watches. You can purchase them all online. 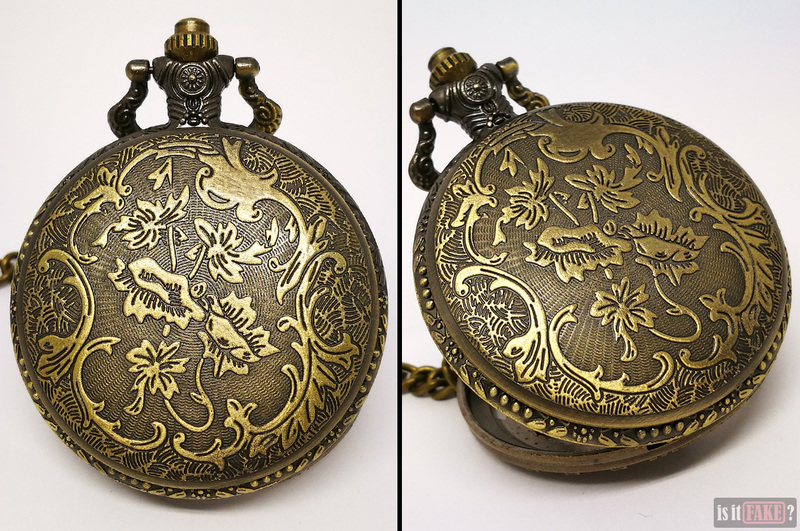 The pocket watch costs $34. 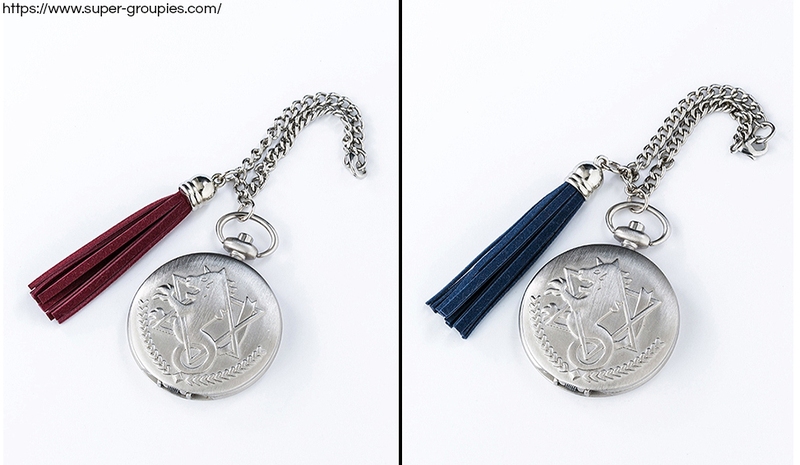 Check out the two different types of pocket watch here and here. 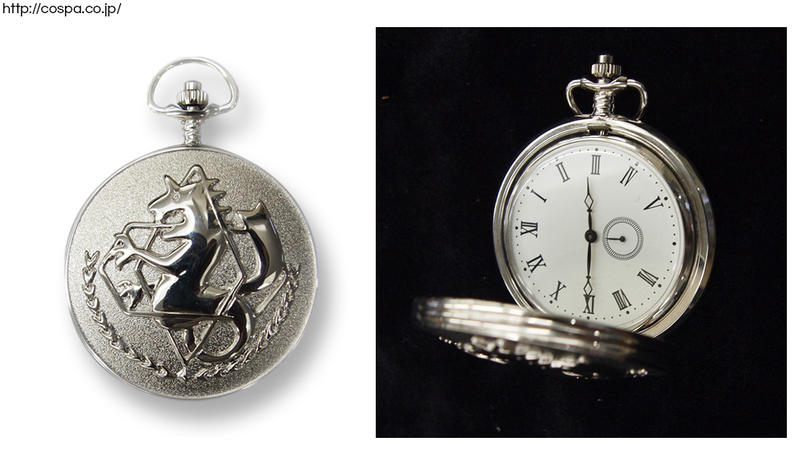 Cospa, the Japanese manufacturer of cosplay items, also produced a gorgeous $86 Fullmetal Alchemist pocket watch. While it’s unfortunate this item is sold out in most online stores, others, such as AmiAmi, Plamoya, and HobbySearch allow you to add the item to a “watch list.” This way, these stores can notify you once stocks are renewed and the item becomes available again. 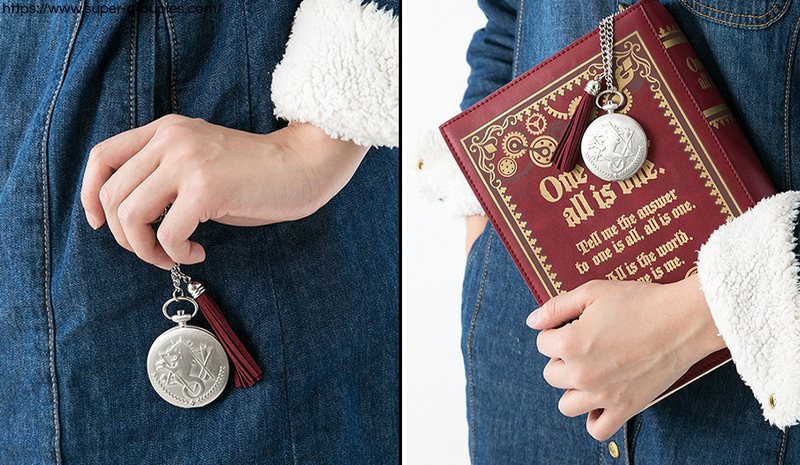 Visit the official Fullmetal Alchemist anime page for a list of other merchandise inspired by the beloved series! 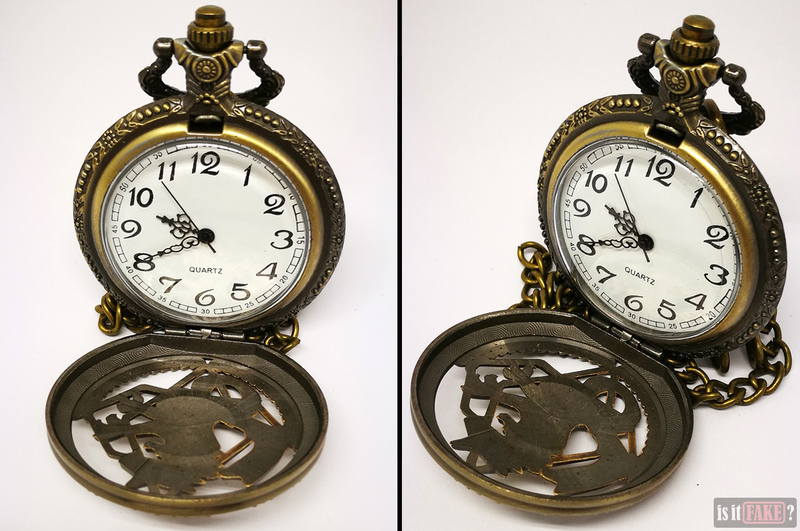 As a prime example of false advertising, this fake Fullmetal Alchemist pocket watch looks far worse in person than in the photographs you’ll see in online stores. The actual product looks filthy, and leaves an unpleasant aroma on your skin when touched. 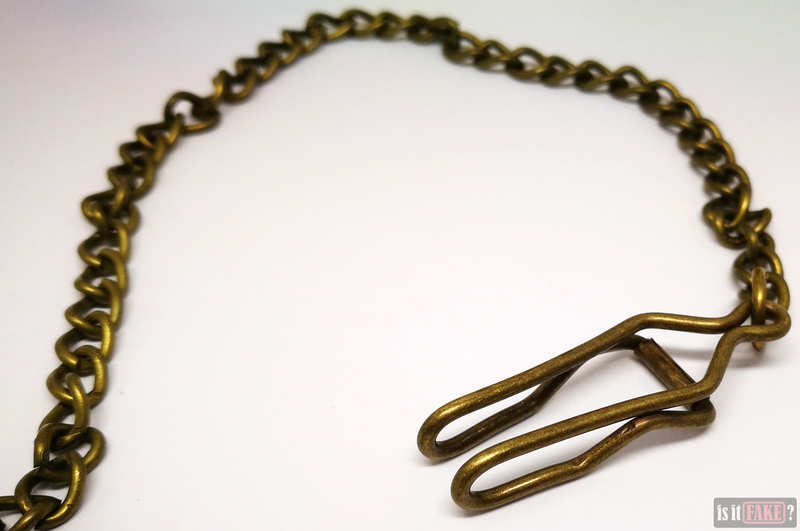 And if your intention is to cosplay, or own an accurate replica of an item from the anime or manga, you’re going to have to look elsewhere, as this item takes huge liberties with the original design. All in all, we think this bootleg deserves no less than a 45% terrible rating.